The Sol Revolution venue has changed, it will now be on in The Odeon. Same line-up etc. Start time is 8.30pm. The summer may be almost over but there's plenty of fun still to be had before you pull your winter coat of off its hibernation. 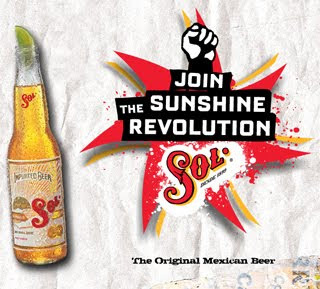 Sol Beer is currently running a great campaign over on its Sunshine Revolution website. Just for the fun of it, Sol are hosting a free gig in Pygmalion and the Powerscourt Centre on the 16th of September. The line will see Super Extra Bonus Party, The Chapters, Kormac Live and Tucan take to the stage in an evening of fun and revelry. But wait, I hear you cry, did you say free? I did indeed say free. Just pop over to the site and register your details. Hey presto, mission complete. The Sol Revolution are also busy promoting the whole event over on Twitter and Facebook. So get following and add yourself as a fan. If you're looking for more info on Sol you can check out the International Beers site or Wikipedia. As Sol legend has it, it all began on a brisk, sunny morning way back at the very end of the 19th centuary. The year was 1899, and in an old lost forgotten factory near Mexico City, named “El Salto del Agua”, a German master brewer chanced upon a brewing pot illuminated by a ray of sunlight, falling in through a dusty window. The brewer stopped in his tracks, captivated by golden ray beaming across the room, pulling his attention to the pot. He decided this new beer would be named “El Sol” (The Sun), and so Mexico's most famous beer was born. Since then Sol has become a popular beer sold around the world, served in its distinctive clear flint bottle always with a wedge of lime. Fantastic! I love Mexican food - it shall be a month of Burritos and Tacos!! A Truely Ice Cold Beer!